Ever wondered why does the price of your stocks rise or fall? Everyday you hear about people making a fortune or losing it all in the stock market. You see stock market appearing everywhere – in the newspapers, on the TV, and on the Internet. Many people buy and sell shares on the stock market without understanding how does the stock market work at all. By understanding a little bit about the stock market, it will make more sense to you why certain stocks soar while the others plummet. After reading this article, you will understand why certain companies appear in the stock exchange, and what drives the fluctuation of stock prices. You will also learn the easiest way to profit from the market without having to speculate stock prices. How Did Stock and Shares Come About? A long time ago, business owners run their businesses using only their own money. Naturally, their starting capital was small, and the growth was slow since they could only grow on their own profits. What if someone wanted to start a business with a huge capital? Banks won’t loan a huge amount of money to a relatively new company, and the owner’s capitals are limited. In 1602, the Dutch East Indian Company wanted to raise a lot of money for their exploration to the East, so they chose to raise money from the common folks. They became the first company to publicly issue shares of their company in the Amsterdam Stock Exchange to be traded by the masses. When a company needs to raise a huge sum of money, they list their company in the stock exchange (the process known as initial public offering, aka IPO) and issue shares. Let’s say Apple has issued 950 million shares in the stock exchange market during its IPO. When you buy the shares of a company, you are buying a piece of the company. A share in a stock stands for a share in the company. So if you buy 1 share of Apple’s stock, you are entitled to 1/950,000,000 of Apple’s company. During the IPO, the share price of a company is determined based on the company’s estimated value, and how many shares are being issued. The company gets to keep the money raised during IPO to grow its business, while the shares issued continue to be traded on a stock exchange, such as the New York Stock Exchange (NYSE) in the U.S.
Why Do People Trade Stocks and Shares? Although the company only receive the money raised from the IPO, its shares continue to be bought and sold on a daily basis by investors all over the world. Why do people continue to trade a company’s shares? It’s because the share price of a company is related to the perceived value of the company. For example, when Apple first started out, the price per share was only $0.50. 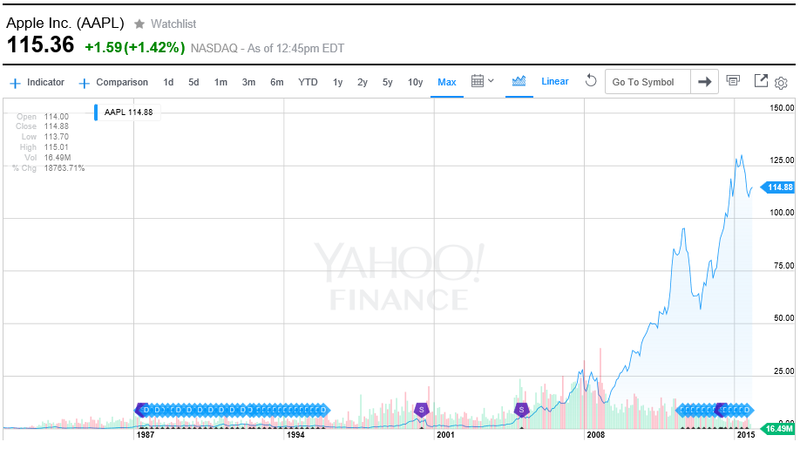 Refer to the entire history of AAPL to see its growth. Why was Apple’s share price so low back then? The company was young and there weren’t many investors looking to buy Apple’s shares. In other words, the demand for Apple’s shares was low. As Apple grew and produced more innovative products, investors noticed Apple and the perceived value of the company increased. When the first iPhone was released in year 2007, the perceived value of Apple rocketed and we see explosive growth since then. Today, Apple’s share price is well over $100.00 per share. As you can see, the real value of the company doesn’t really affect the share prices. It is the perceived value of the company that drives share price fluctuations. Even a simple rumor can drive the share prices up or down. For example, if majority of people believe Apple will do well, more people will want to buy its shares, driving the prices up, and vice versa. When Steve Jobs passed away in 2011, Apple’s stock price fell because many people believed Apple wouldn’t do as well without Steve Jobs, even though the real value and earnings of the Apple company didn’t really change. To put it simply, the stock prices depend on the sentiments of the investors. If a company appears to be doing well, more people will want to buy its shares driving the prices up. On the contrary, if majority of investors believe that a company is doing poorly, they will want to sell their shares, driving the prices down. It all boils down to the basic economic principle of supply and demand. If the demand for the shares is high, the prices go up. If supply is greater than demand, the prices go down. If our perceptions are in agreement with the market’s sentiment, and buy shares of companies before the other investors jump in, we can buy low and sell high, earning ourselves a good profit. The basic principle sounds simple enough, but trying to predict which stock will rise or fall, and when it will happen, is extremely difficult. Most of the time, market as a whole is irrational. Many investors buy shares without doing much of a research on the company behind it. 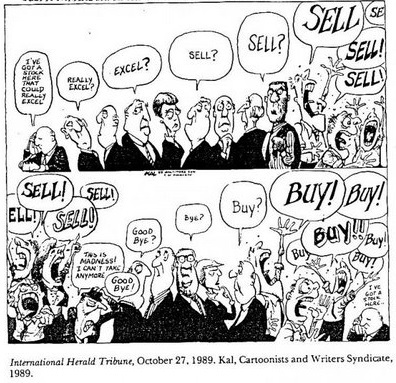 Whenever an investor buys a stock based on a “hot insider tip” from a friend, there may be rumors to sell the same stock flying around elsewhere, all at the same time. As a result, tens of thousand of investors all over the world affect the share prices every single day by buying and selling shares based on their individual decisions, be it informed or uninformed. Unless there is a very clear market sentiment, trying to predict stock movements is almost impossible. While there is no way to determine stock movements in the short term, over time stocks as a whole do tend to rise. In the short term, the market is a voting machine. In the long term, the market is a weighing machine. This is why many investors choose to buy a basket of stocks and hold them for long-term, taking advantage of the long-term bias and not concern themselves with the short term fluctuations of the stock prices. This method of investing is called buy-and-hold, and can be done very effectively through mutual funds, which is essentially a basket of stocks sold as a bundle. Mutual funds are generally safer than single stocks because it offers diversification. For more information, read Investing in Mutual Funds For Beginners. Do you invest in the stock market? What approach do you use? Let us know in the comments below!